This week Democrats gathered in Philadelphia to officially nominate Hillary Clinton as their party’s presidential candidate. How do Americans view Clinton – a fixture in national politics for more than 25 years – as the race between her and Donald Trump for the White House begins in earnest? Here’s a roundup of key Pew Research Center findings on views of Hillary Clinton, her politics and the impact she would have on Washington. 1 More voters say they know a lot about where Clinton stands on important issues than say the same about Trump. 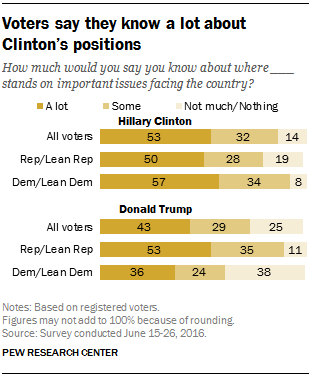 About half (53%) say they know a lot about Clinton’s positions; by comparison, fewer (43%) are confident they know where Trump stands. Republicans and Republican-leaning independents are just as likely to say they know a lot about where Clinton stands (50%) as they are about Trump (53%). Democrats and Democratic-leaning independents, on the other hand, say they know much more about Clinton’s positions (57% say a lot) than Trump’s (36%). 2Few voters think gender will hurt Clinton this fall. Only about one-in-ten registered voters (12%) say the fact that Clinton is a woman will hurt her this fall. Most say it will either help her (40%) or not make a difference (45%). There is little difference in these views along partisan lines, but there are modest differences in these perceptions between men and women voters: Overall, 47% of women and 43% of men say Clinton’s gender won’t make a difference to voters this fall; men are somewhat more likely than women (45% vs. 35%) to say Clinton’s gender will help her. And though few men or women think her gender will hurt her, this view is more prevalent among women than men (15% vs. 9%). 3 Supporters and opponents see Clinton’s political views differently. About six-in-ten voters (58%) in our latest American Trends Panel survey say Clinton’s views are liberal on most or almost all issues, while nearly three-in-ten (28%) say she has a mix of liberal and conservative views. Yet there is a large gap in how Trump and Clinton supporters describe her views. 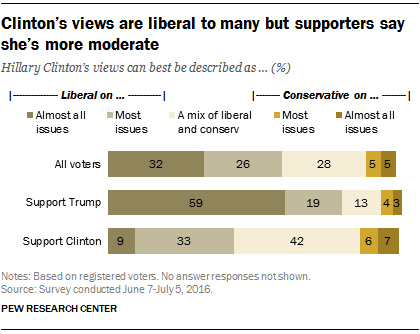 About three-quarters of Trump supporters (78%) say Clinton has predominantly liberal views, including 59% who say she is liberal on almost all issues. By contrast, Clinton’s supporters are just as likely to say she has a mix of liberal and conservative views (42%) as to say her positions are predominantly liberal (42%). Just 9% say she’s liberal on almost all issues. 4 Many voters – including many of her supporters – doubt Clinton will change Washington much. Overall, about half (53%) of voters in our June survey say Clinton won’t change the way things work in Washington much. Those who think she will change Washington are divided on whether it will be for the better (20%) or the worse (25%). Even voters who say they will support Clinton in a matchup against Trump this fall say she’s unlikely to bring much change to the way things work in Washington. Well over half (58%) say this, while another 38% say she will bring positive change. Trump’s supporters are roughly evenly divided between those who say she would make things worse (52%) and those who say things wouldn’t change much under a Clinton administration (46%). Democrats and Democratic-leaning independents who supported Bernie Sanders during the primaries – most of whom now say they will support her against Trump – are especially doubtful Clinton will bring change to Washington: 70% say this, compared with 47% of Clinton’s primary supporters. 5 Democrats feel warmly toward Clinton, while Republican views of her are very cold. Hillary Clinton is a polarizing figure in U.S. politics. 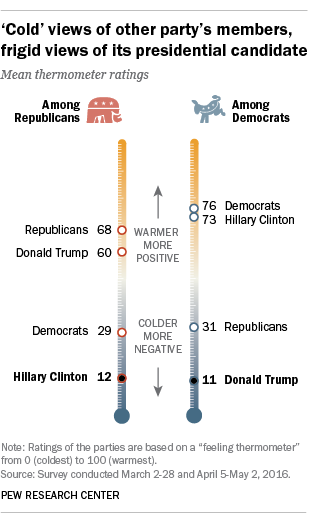 In a survey conducted this spring, Democrats give her an average rating of 73 on a 0-to-100 “feeling thermometer,” where 100 is the warmest, most positive rating and zero the coldest, most negative. Republicans, on the other hand, give her an average rating of 12, and 59% give her a zero on the scale. Republicans’ deeply negative views of Clinton find a parallel in Democrats’ deeply negative views of Donald Trump, who rates an average of 11 on the scale, with about two-thirds of Democrats giving him a zero rating.